Die cuts use cookie-cutter technology to create a brochure that's completely unique. Die cuts are created with a sharp steel blade formed into a specific shape. When the blade presses onto paper, it makes a cutout of the shape – just like a cookie cutter slicing through fresh dough. Die cuts can produce ordinary shapes like circles, curves and stair steps, or custom ones like city skylines or palm trees. A die cut brochure might have a curved edge or a flap shaped like a puzzle piece. It could have a cutout in front that offers a glimpse of what's inside. It might be shaped like a product or combined with custom folds to create something that feels like a work of art. Because they're unique, die cuts have a "wow" factor that makes people want to save them and share them with family at home and friends on social media. That means that a single die cut brochure can create a big impact. Die cuts can produce striking effects when they're added to a brochure. Because of the way a brochure is folded, you can go beyond simple die-cuts and create interactive elements that act like a pop-up book when the brochure is opened. Imagine a finger the jumps out and literally points to your deal, address, or logo. As you can imagine, this is very technical to design but we can help you bring your vision to life. Die cutting blades are razor sharp and can handle fine details. Good design is especially important for die cut brochures because the die cuts, images and text must line up properly when the brochure is folded. Design your die cut flat and use reference points to make sure everything is aligned. Take paper thickness and weight into account to avoid a misaligned image – die-cuts can work with a huge range of paper thickness but your paper should be on the stiff side. Internet marketing may be popular, but people still respond to promotional pieces they can hold in their hands. With die cutting and special sizes, brochures can go far beyond describing tourist destinations and products and services. Distribute brochures as presentation handouts. Display your portfolio in a brochure. Have everyone on your team keep a stack of company brochures in their car. You never know when you might meet a potential customer. Die cutting is an opportunity to use brochures to brand your business. Die cut brochures look creative and luxurious, and they invite people to interact with them on a physical level. You can use a die cut to highlight part of your logo or draw a connection to your product or industry – like a rooftop outline for a building contractor or a cupcake shape for a bakery. Use die cuts to create a sense of anticipation, so people can't resist opening your brochure to see what's inside. Cut out a shape or edge on the front of your brochure to reveal just part of the image underneath. If you're mailing your brochure, use a die cut to make it look and feel like an envelope, without the added postage and handling costs. Add personalization and your recipients will feel like you've written especially to them. Brochures might seem old fashioned, but die cutting gives them a fresh, upscale look and lots of personality. 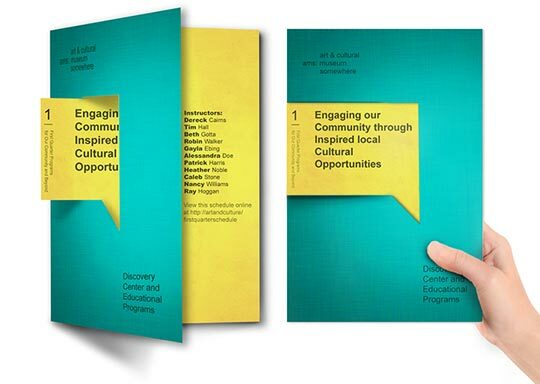 Use die-cuts to create a custom brochure that will be the talk of the town. Need technical or creative advice on your die cut brochure project?